Rice puddings can be made in a variety of ways. But the rice pudding made with jaggery and coconut is a traditional sweet served in the Christian churches of Kerala, a small South-Indian state. 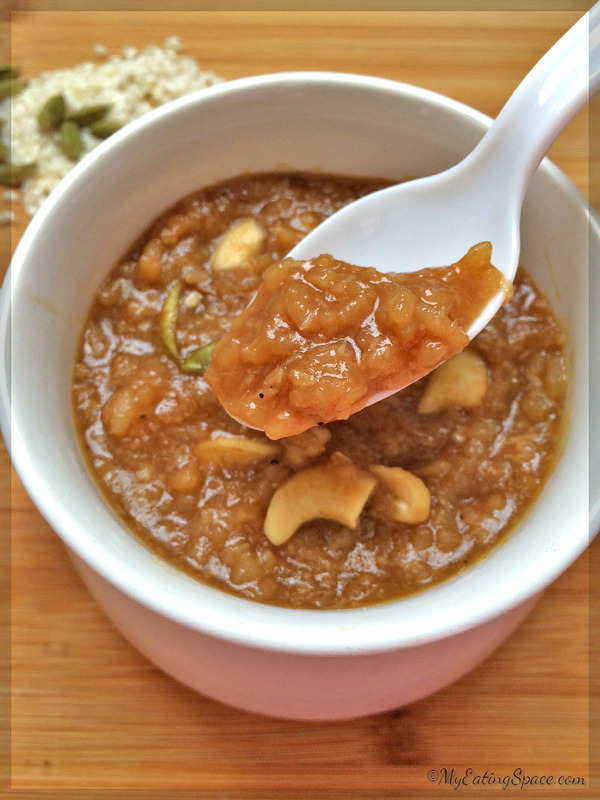 This pudding is almost similar to the jaggery pudding made during the ‘Navarathri’ festival. This rice pudding is served after the service to all the people that come to church on any special occasions. Of course, different churches have different offerings. But most churches serve rice pudding as an offering. In this rice pudding, jaggery is used as the sweetener. 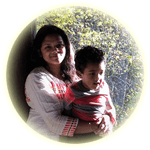 I usually make a batch of jaggery syrup since I use it in many sweets instead of sugar. 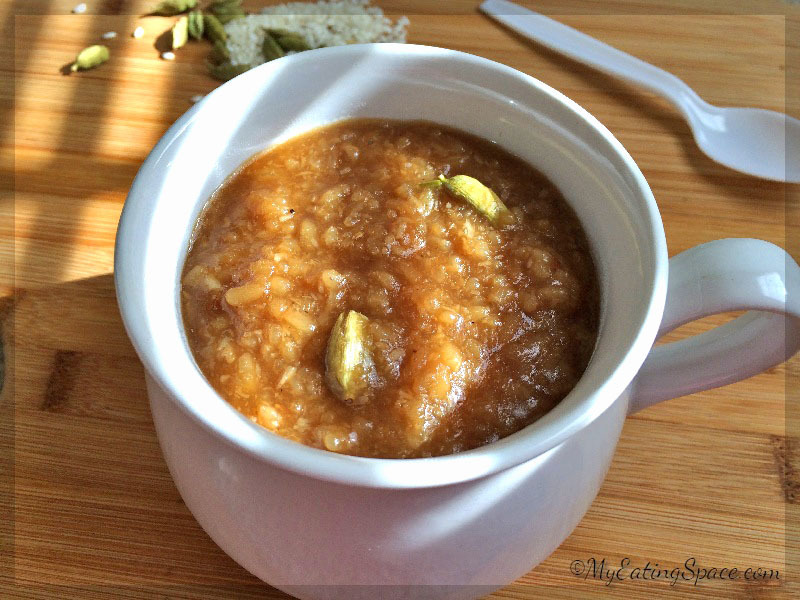 Here is the recipe for simple jaggery syrup. The pudding can also be made with sugar but the taste will be entirely different.I also added a pinch of nutmeg powder and ginger in addition to the usual flavors. 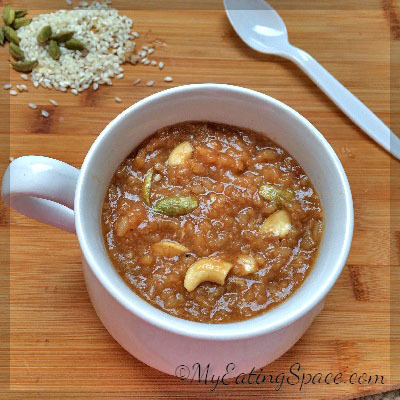 Rice puddings with jaggery are the traditional delicacy from South India. The mouth-watering dessert is flavored with lots of spices. This can be served as a breakfast or with evening tea. Wash the rice 2-3 times in cold water. Drain and keep aside. Take water in a large thick bottomed vessel. Bring it to a boil. Reduce the heat to medium. Add the rice into the boiling water. Add salt and mix well. Cook on medium heat until the rice is soft and can be mashed with your fingers. Now add the jaggery syrup, coconut, ginger, cumin seed and cardamom pods. Mix everything together. Now cook on medium-low heat with occasional stirring until the mixture is thick but not dry. Switch-off the heat. Add powdered cardamom,nutmeg powder, raisins and cashew. Mix again. The rice pudding is usually served lukewarm. But it tastes good when cold also. Use large vessel. The rice will absorb the water and double in size. So there should be enough space. Use thick-bottomed vessel. The rice with jaggery syrup has a tendency to stick to the bottom. Spices, flavors and dry fruits are your choice. You can add peanuts, almonds, dried berries, cinnamon,cloves etc. Rice puddings made at home are usually served as breakfast or with the evening tea. Some people like to have a spoon of pickle with this sweet pudding and that is totally optional. I like it when the sweet combines with the hot and sour pickles. Enjoy the rice pudding dollops packed with instant energy. If you like grain puddings, also try the Kerala-style Wheat Pudding. Thank You Rafeeda. I hope you will like the pudding.